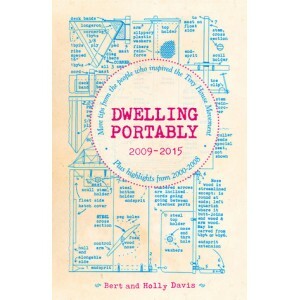 The Dwelling Portably series returns with Holly and Bert’s newest contribution to their fourth decade of DIY homesteading. The 2009–2015 collection assembles their correspondence and what they’ve picked up over the last six years, lovingly crafted on manual typewriters from a remote Oregon outpost. The tips and tricks of the series are practical and useful—pertaining to things like biking, permanent camping, alternative communities, DIY healthcare, disaster preparation, eating off the land, and MacGyver-like skills to prepare you for any and all situations. Whether you’re planning to step off the grid or just simplify your life a little, Dwelling Portably has something for just about everyone. Learn the values of eco-insulation as opposed to synthetic, how to make a DIY wood-burning stove out of a 5-gallon steel drum, how to convert a plastic storage in to a “cold frame” for seedlings, and information about what simple vessels are ideal for mid-ocean dwelling.